This material is from the 2013 Summer Solstice to Autumn Equinox Contest. are disqualified from voting, as is the RASC Archivist. 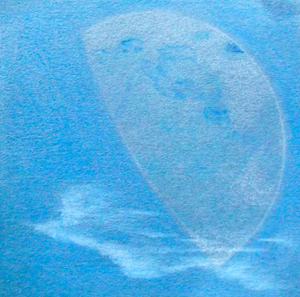 D) original artworks based on visual observations of one or more celestial objects. entries will be placed in a gallery on rasc.ca (http://www.rasc.ca/2013-summer-solstice-autumn-equinox-contest), and judging will be done by list members - the entry in each category with the most votes wins! Voting will commence after the closing date for entries on 2013 September 24 at 24:00, and will last till 2013 October 5, after which the winning entry will be announced. Instructions for voting will be sent out 2013 September 24. Mystery prizes – relevant to astrosketching - will also go to the winners! And the winning entries may appear in JRASC with due accolades. Send your entries to astrosketchers@lists.rasc.ca with the subject heading “RASC astrosketch contest”, and the subject of your entry. Sketch done using graphite pencils, ink and "whiteout" on smooth white paper. "Whiteout" is used not only to get those brilliant peaks and white patches, but to create roughness so as to simulate rougher terrain which is then sketched over with pencils. 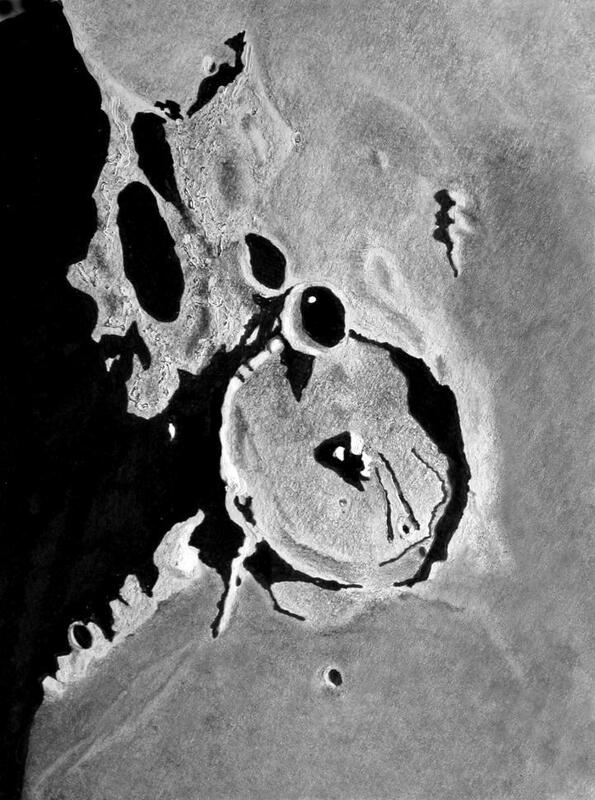 I rather like the effect (seen in my sketch up to the left of the main crater) as it is quick and effective when using smooth paper, but it is done to simulate rough terrain rather than actually plot exact features. I think of this as being similar to just making a lot of dots to simulate a globular rather than plotting each star. 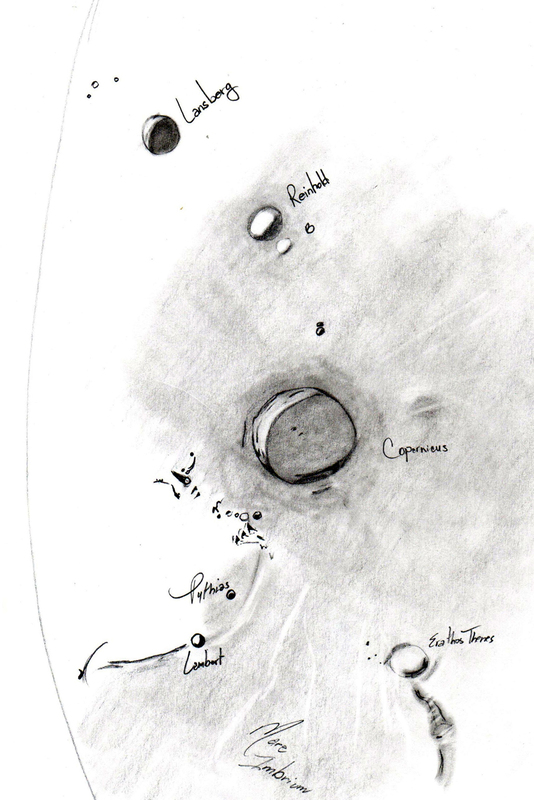 These lunar scenes contain far more data than I can plot so some compromises are taken. :-\ The sketch was photographed and flipped to proper view with North up and West to the right. The usual contrast and brightness were applied to compensate for the imaging process and to make it appear more like the visual experience. This sketch was done some 37 years after my first sketch of Gassendi. It's an old friend that still holds much interest. 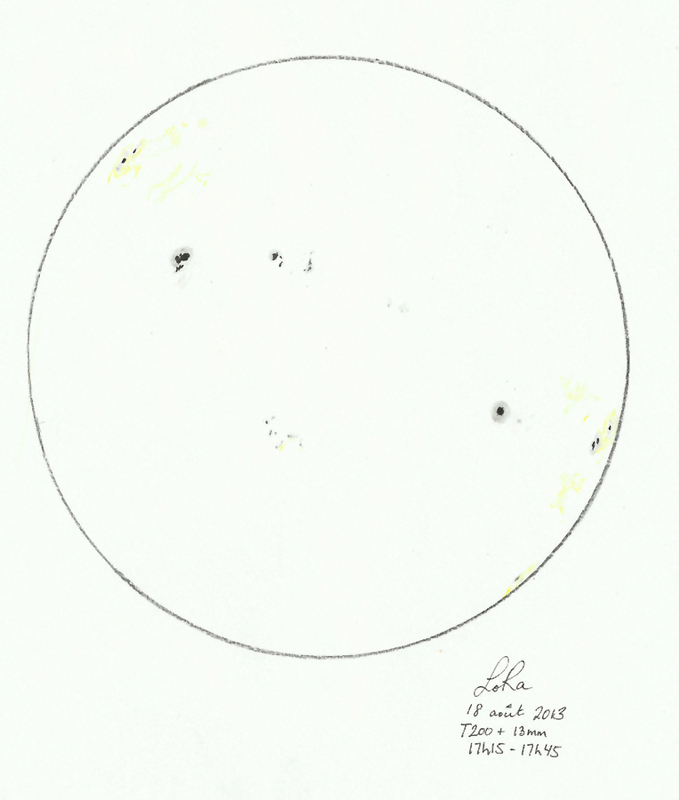 Louise Racine © Sketch of the Sun, 2013 August 18th. This was sketched with graphite pencils, yellow pencil and black pen on standard white paper. The telescope was a Newtonian dobsonian 8'' with a Baader Astrosolar filter and a 13mm eyepiece. (Sorry for the blue effect, seems to be the result of scanning). I drew this picture on September 14th, 2013 from about 9:15 PM to 10:30 PM CDT from Winnipeg Manitoba. I used a Mead LightSwitch telescope with a 2 inch 8 MM eyepiece. I used graphite pencils and an eraser. NOTE: all images are copyright of the artists, and must not be reproduced without prior consent. For further information please contact the contest administrator.